Hello friends! Giovana here today with a couple of cards, both similar, easy and very elegant! 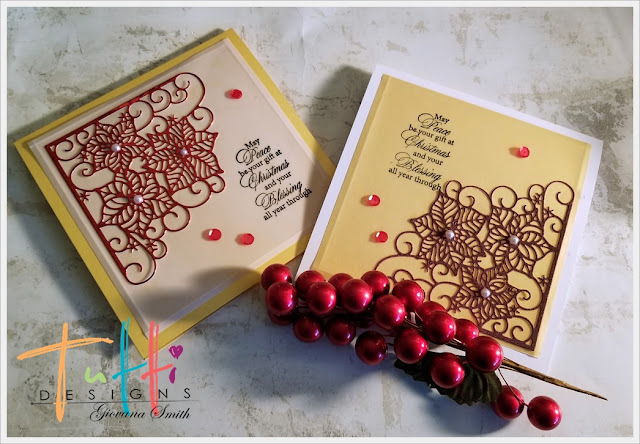 For this project I used Poinsettia Corner, this die is very delicate and elegant. Die-cut the beautiful Poinsettia Corner in Metallic and Glitter Red Cardstock. Cut a card base 11" x 5.5" and scored at 5.5" (here I used White and Gold cardstock for card bases) and cut card fronts 5" square in Gold and Clear Vellum. Stamp sentiment on vellum, score 1/8" on each side. Then, adhere the poinsettia, I used my MISTI and as you can see on the picture I used the 1/4"corner to align the die and get the perfect position. Finally, adhere the panels to card bases and add red sequins. These are gorgeous Giovana ... very clever & beautiful design! Thanks for wonderful inspiration! Stunning card, Giovana! So elegant! Beautiful cards Giovana, love the sentiments too. Love the color combination and how it enhances the dies!